awfully big reviews: WHERE THE POPPIES NOW GROW by Hilary Robinson and Martin Impey. Review by Penny Dolan. WHERE THE POPPIES NOW GROW by Hilary Robinson and Martin Impey. Review by Penny Dolan. This year we are, in a variety of ways, commemorating the outbreak of the 1914-18 Great War. Although Odeon Cinemas are offering the Morpurgo’s “Warhorse” ntlive production, and the novel has shot to fame and film, teachers involved with the Key Stage One “picture book” age may also want to be involved in the significant year. Where can they find a book to fit this sombre anniversary? Maybe with this title? 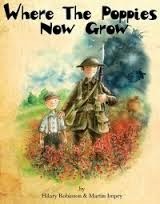 Schools – and possibly families - will surely welcome “Where the Poppies Now Grow”, a book inspired by the family histories of both writer and illustrator. 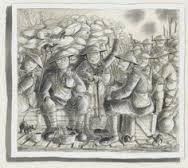 As the rhyme grows, the book tells how the two childhood friends, Ben and Ray are eventually forced to join up and share the terrible experiences of the trenches together. It is clear from the mood and detail of the pictures that this is a terrible event, even though the two pals do at last return home. The text is sympathetically developed through Martin Impey’s powerful illustrations of both friendship and war, using a colour palette that is totally fitting for its sombre purpose. “Where the Poppies Now Grow” is published by Strauss House Productions. I got carried away with my googling, so must mention that the final Martin Impey illustration shown here comes from his work on Michael Morpurgo's "Warhorse" (OUP). Such a fine illustrator!